The New Revised 4S Completer Pack! It comes with the Traxxas 2973 Dual 4S 200W charger and (x2) 4S 5000mAh 25-50C Batteries, versus the old single 4S charger completer pack. Traxxas EZ-Peak Live iD completer packs include battery packs and a charger for tire-scorching high voltage power. 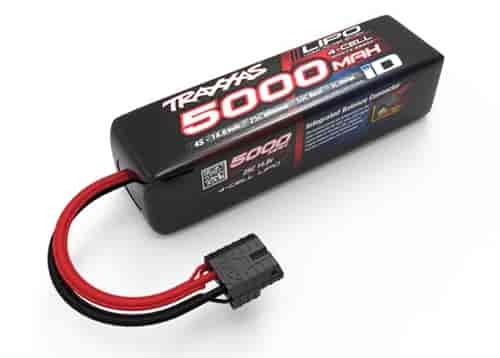 Traxxas iD batteries are the easiest and safest LiPo charging solution when used with Traxxas iD chargers. You just plug in your iD battery and press start. The iD charger handles all the settings and quickly gives you an optimized charge every time. The 4s LiPo battery capable EZ-Peak Live multi-chemistry charger comes equipped with built-in Bluetooth to work with the new EZ-Peak Live app for iOS and Android. The app gives you detailed information and advanced operation through a high-definition color interface. Battery and charger in one package--Traxxas EZ-Peak Live iD completer packs deliver extreme power. The EZ-Peak Live Dual iD Charger takes all the advanced features of the EZ-Peak Live and supercharges the power output to over 26 amps (200 watts)! The 4s capable multi-chemistry dual charger uses built-in Bluetooth to work seamlessly with the Traxxas EZ-Peak Live app for iOS and Android! The EZ-Peak Live app gives you detailed information, remote monitoring, and advanced operating functions through the high-definition color interface on your mobile device. It’s the most powerful, most advanced charger in the popular EZ-Peak lineup. Get back in the action sooner with the new EZ-Peak Live Dual Charger! Just plug in a Traxxas iD-equipped battery and press start - that’s all there is to it! The iD system detects which Traxxas iD-equipped battery you are using and automatically configures the settings for the optimal charge. The progress bar and audible alerts keep you informed while the advanced high-resolution peak detection delivers a perfect charge every time. The EZ-Peak Live’s Storage Mode protects your LiPo battery investment by safely preparing the batteries for extended storage. The MAXX Charge feature takes full advantage of LiPo batteries’ high charge rates. Press the MAXX Charge button and the right side charges at the maximum charge rate the battery will allow (up to 16 amps). The left side receives the remaining power until the right side finishes and then the left side switches to MAXX power mode. This innovative design gets one battery ready in nearly half the time so you’re back in the action having fun. The charger automatically detects the type and size of your iD-equipped battery and configures the settings for the fastest charge possible. With 200 watts of power on tap, EZ-Peak Dual maximizes its charging potential for NiMH and LiPo batteries. Two high-flow fans keep the temperature down for extended charging sessions. 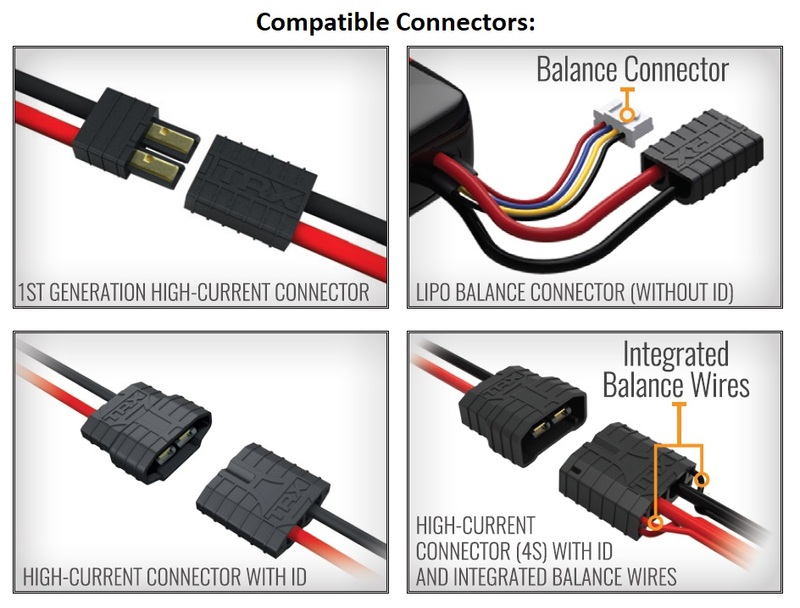 Dual balance ports provide backwards compatibility for batteries with external balance leads. There’s even a special 2-amp USB output to charge your mobile device. The free EZ-Peak Live App installs on your Apple® iPhone®, iPad®, iPod® touch, or Android™ device and links to your charger via built-in Bluetooth®. The EZ-Peak Live App gives you access to additional features, such as a high-definition graphical user interface, firmware upgrades, remote monitoring and alerts for up to 4 chargers, detailed live charging information, and the ability to turn off iD mode. iD mode may be switched off through the EZ-Peak Live Application for charging first-generation Traxxas batteries with non-iD High-Current Connectors.